Ahly squad arrived in Tunisia Wednesday ahead of Friday's match against Esperance in the fifth round of the African Champions League group stage. Midfielder Amr El-Sulaya has been declared fit for the game, while winger Momen Zakaria has been sidelined due to technical reasons according to assistant coach Mohamed Youssef. The record eight-time African champions Ahly will be hosted by already-qualified Esperance at Rades Stadium as they seek to secure their passage to the last eight. El-Sulaya missed Monday's 0-0 draw against Lebanese side Nejmeh in the Arab Championship opener due to injury. 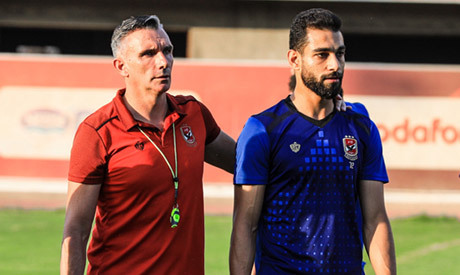 "El-Sulaya is completely ready for the Eseperance game after recovering from his hamstring injury," Ahly's doctor Khaled Mahmoud was quoted as saying by the club's website. Ahly's French coach Patrice Carteron named his 23-man squad for the Esperance game Tuesday. Esperance lead Group A with 10 points, three ahead of second placed Ahly with two matches remaining.